President Trump vowed to isolate Iran during his major address to Gulf leaders in Saudi Arabia. He accused Iran of funding, arming and training militias and other extremist groups in region while ignoring Saudi Arabia’s role in destabilizing the region. Trump’s remarks came just two days after Iranian President Hassan Rouhani was re-elected in a landslide vote Friday. Rouhani’s main challenger, hardline judge Ebrahim Raisi, received only 38 percent. 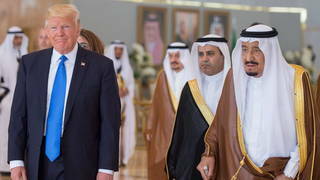 For more on Trump’s trip to Saudi Arabia and Iran’s election, we speak with Trita Parsi founder and president of the National Iranian American Council. He’s the author of the new book "Losing an Enemy: Obama, Iran, and the Legacy of Diplomacy," out next week.